Happy Monday everyone! Hope everyone was able to be out in the little bit of sun we got over the weekend. With this Monday’s post we will be focusing on volunteers. 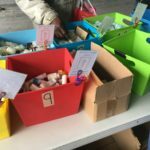 They have been an integral part of our giveaways and we wanted to start spotlighting one volunteer each month. We can’t say enough about our volunteers and our hope this is at least a small gesture each month to recognize their efforts. We also want to invite anyone who has physically been to a giveaway or has helped in any physical way behind the scenes to join our ATXHAW Volunteer Facebook group page. Everyone is always asking us what they can do to help and we now have finally answered that question, come talk to us on our ATXHAW Volunteer Facebook Group. This is a closed group and is only opened to those we have physically met. If you are interested in helping, please email info@austinhumanistsatwork.org. We’d love to work with you. 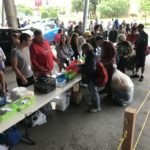 Remember as always, if you have any donations email donations@austinhumanistsatwork.org to arrange a pick up from one of our many wonderful volunteers all over Austin and surrounding areas. If you’d rather mail a donation to our wonderful Donations Coordinator, check out our Amazon Wishlist. How did you find out about the Austin Humanists at Work and when did you start volunteering? What have you done and currently do within the organization? I started and run Gettin’ Knotty which entails, coordinating the guild meetings, crochet and knit items for the group and also teach people to knit and crochet during our meetings. 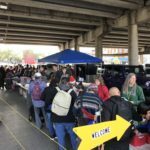 I help pick up donations for our giveaways, have worked many giveaways, stored and sorted donations, written articles for the website, participated in and ran extra events for Beyond the Basics and helped organize drives. In June 2015, with the help of others, I took charge of the administrative side of the organization, and took on the role the of Director of Communications. In an effort to further our organization we have created an official Board of Directors and I am serving as the President and work with an amazing group of dedicated people. I helped in the process of rebranding our organization and am really excited about what the future holds for Austin Humanists at Work. What do you like most about the work you do with the Austin Humanists at Work? 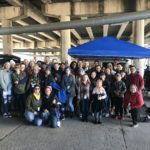 My favorite part of what I do is connecting with the people in the community, those ATXHAW serves and the people who volunteer and donate. My world view has broadened since coming on board, knowledge has been a powerful aspect and advocating for people who need it most is what it’s truly all about for me. 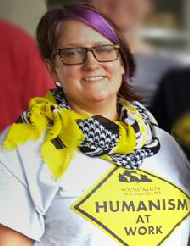 Tell us a little bit about yourself outside of Austin Humanists at Work. I was born in Richmond, Virginia, but lived in Pennsylvania for most of my life, before my family moved to Austin a few years ago. I am a homeschool mom of two fabulous girls, a Girl Scout Leader and always on the go. I wear many hats in life but mom is my favorite hat. I love to sing the shower and am a huge movie buff! Currently I’m watching 366 movies in 2016. I love a large variety of movie but psychological thrillers, dark comedies and independents are my favorite. Name one thing you’ve learned about homelessness since volunteering for the organization? They are not homeless people. I am not a homed person and it is incorrect to categorize a temporary condition. Each person experiencing homelessness or struggling to stave off homelessness deserves to be recognized as a person first and all conditions of living put aside. Labels can be a dangerous thing. Labels can be a trap and push people down and out of view if we allow them to. First and foremost, we are all humans and no label should stop us from treating any person with dignity and compassion. So, I’ve stopped calling anyone a “homeless person” since they are so much more than their current situation. An amazing group with awsome volunteers providing much needed help. Thank you Jessica. We appreciate your support. Take care.